Roux (pronounced “roo”) is a classic French mixture of cooked fat and flour used by chefs as a sauce/soup/stew thickener. Though the most common fat used is butter, you could also use rendered duck fat or any rendered fat from bacon, pancetta, duck breasts, goose breasts, and other fatty cuts of meat. Traditionally equal parts fat and flour (by weight) are used, though if you’re making a roux from pan drippings/rendered fat you’ll likely have to eyeball it and just add flour, stirring, until a very thin paste/wet sand consistency has been reached. Bread flour is the most common choice, although you can use other varieties. 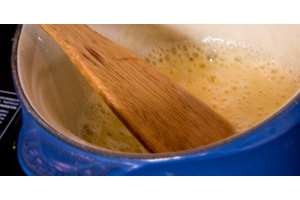 The longer a roux cooks, the more the starch granules are toasted and the darker it becomes. Toasting starch increases its nutty flavor, but decreases its thickening ability. White Roux: Cooked over medium heat. Neutral flavor and strong thickening power. Blond Roux: Cooked to blond/light brown over medium heat. Slightly stronger, nutty flavor with slightly weaker thickening power. Brown Roux: Cooked over low heat to a darker brown color…think brown gravy. 1/3rd the thickening power of white roux, but with a rich, toasty flavor. For very dark brown roux, you should first toast the dry flour in the oven until dark brown, then make the roux. Black Roux: Black roux is also known as burnt roux or ruined roux. Time to throw it out. It won’t thicken your dish, and will instead impart a nasty bitter flavor and oil-slick like consistency. 1. Melt butter in saucepan on low. 2. Once the butter is melted, add the flour. 3. Stir over medium-low heat. The consistency should be like wet sand. If drier, then you need more butter. If moister, then you need more flour. 4. Cook for a few minutes (just until the mixture doesn’t taste like flour…it should smell a little like baking pie crust) for white roux. 5a. For blond roux, keep cooking, stirring occasionally, until the mixture becomes a blond/light brown color. 5b. For brown roux, reduce the heat to low and slowly cook until the mixture is a darker brown. 6. Either add your roux to the liquid being thickened or add that liquid to your roux. a. If using a hot liquid, stir constantly while adding one to the other, to make sure the roux evenly distributes rather than clumping. b. If it’s a cold liquid, stir in some of the liquid, whisking until the roux is completely integrated, then add the rest, or (if adding to a liquid in another pot) remove some of the liquid, stir in the roux, and return it to the pot. 7. Bring the mixture just to a boil, then reduce to a simmer. Simmer for 10 to 20 minutes (until thickened). Use about 1 parts (by weight) white/blond roux to thicken 10 parts sauce in order to reach a consistency that will coat the back of a spoon. You’ll need to use more brown roux (perhaps as much as 1 part roux to 3 parts sauce) to achieve the same consistency. I love the “How to” series of posts. My co-workers were filling me in on the necessities of Roux just the other day. Glad you like them, Missy…we had a photo shoot yesterday and we’ve got lots more coming in the next couple weeks, so stay tuned. Among them, how to make aioli, sear tuna, pan roast a steak, and more. Everyone should start this recipe in equal parts but my experience shows me it takes a bit more flour than oil if you want a cajun style roux.